I didn’t find much this week. Perhaps that’s partly bad luck, but a lot of people go on vacation this time of year and I’ve taken a few extra days off as well. Next week seems like a better bet anyways, as the end of the month approaches and people prepare to move. Around a month ago I found a nice collection of perfumes in a part of Rosemont with a Tuesday evening garbage pickup. 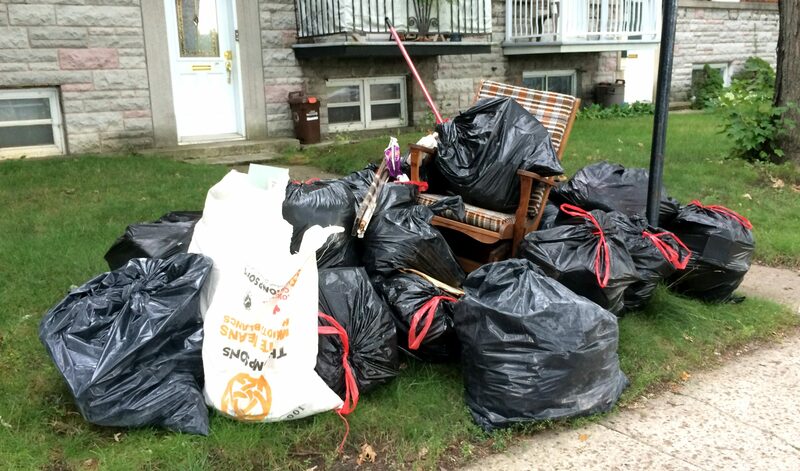 I’ve been going back to that neighbourhood every garbage day since then, finding a few more good things at that spot (the homeowner also gave me a bunch of stuff, but I’ll share that story later). That well, and the neighbourhood in general looked to have run dry this week, but thankfully I happened upon this pile of trash on one of the last streets I was planning on covering. I was intrigued by the old school rocking chair and the larger than average collection of bags. 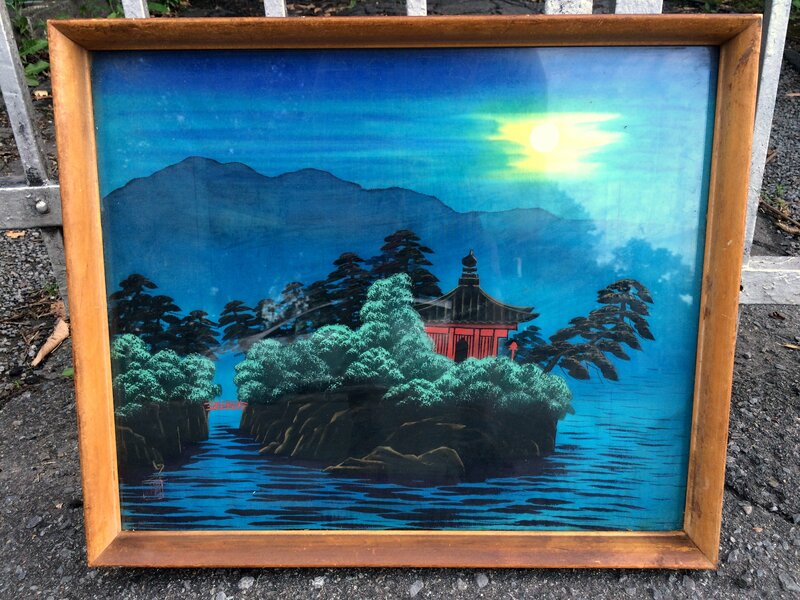 The biggest thing I saved was this old Chinese painting, which I’d guess was bought in Chinatown around the 1960s. However, most of my finds were small bits of vintage junk, also known as my favourite brand of stuff. 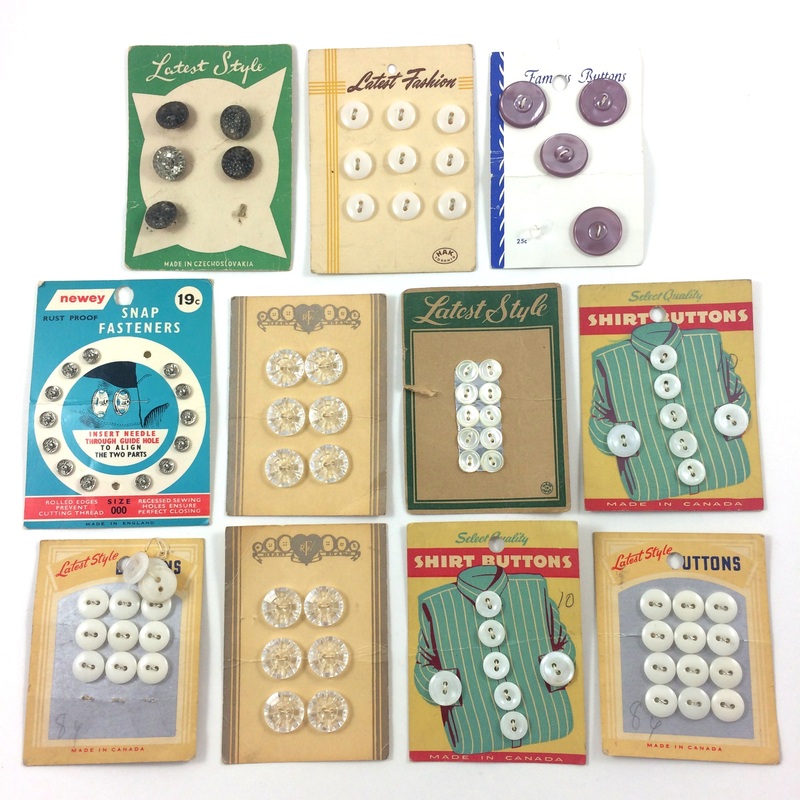 I’m sure some of you will appreciate these old button cards. I especially like the graphic design of the Select Quality Shirt Button cards, the ones with the drawings of an actual shirt. They’re not worth a lot, but I’m sure they’ll sell at a yard sale. Inside a little bag was a collection of figurines. Elephants are well represented here. I particularly like the faux crystal rabbit and elephant, as well as the Jaguar, all of which look to be key fobs originally. Here’s some miscellaneous doodads. There’s a few bits of vintage restaurant ephemera here, with two keychain fobs from the long gone Kon Tiki restaurant as well as a bowling pin fob from Da Giovani, which is still open today. 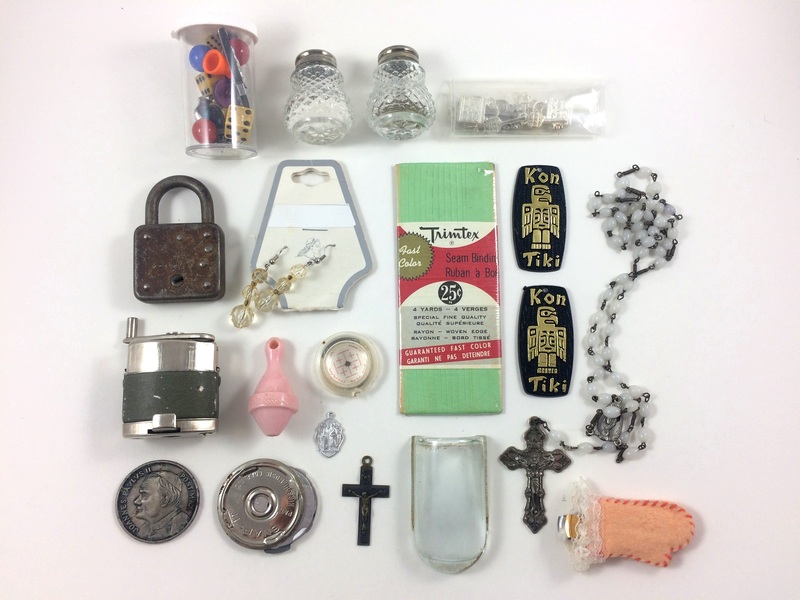 Otherwise, I found a nice rosary, a small bag filled with key and lock charms, a coin commemorating Pope John Paul IIs visit to Montreal in 1984, an oven mitt clip, and a pill bottle filled with more junk. Here’s the contents of the pill bottle, minus the three marbles that wouldn’t sit still for the photo. The tiny die on the left is kind of neat, it feels like it’s made of stone and looks to be hand painted. I have a similar one I found previously kicking around somewhere. … and a cool vintage tin. 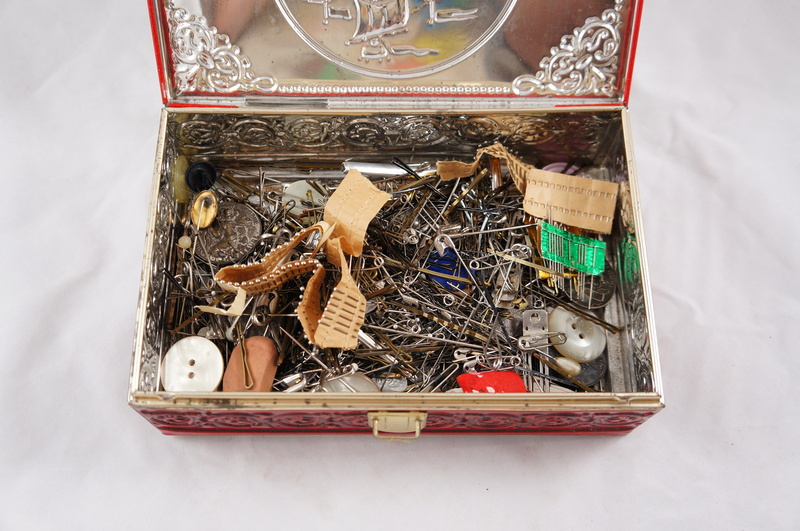 Inside the tin was a collection of sewing bric-a-brac, including lots of sharp pins. However, if you look closely you also notice that it holds a bunch of old medallions. Here are the items that weren’t sewing related. Most of the medallions are Catholic. 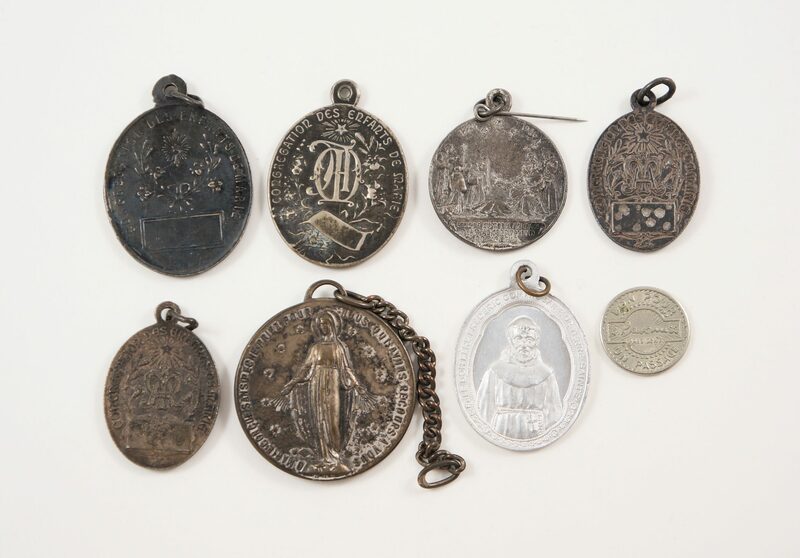 It’s not uncommon to find medallions of this kind in Quebec, but some of these are quite old, dating back to the 1920s and 1930s. 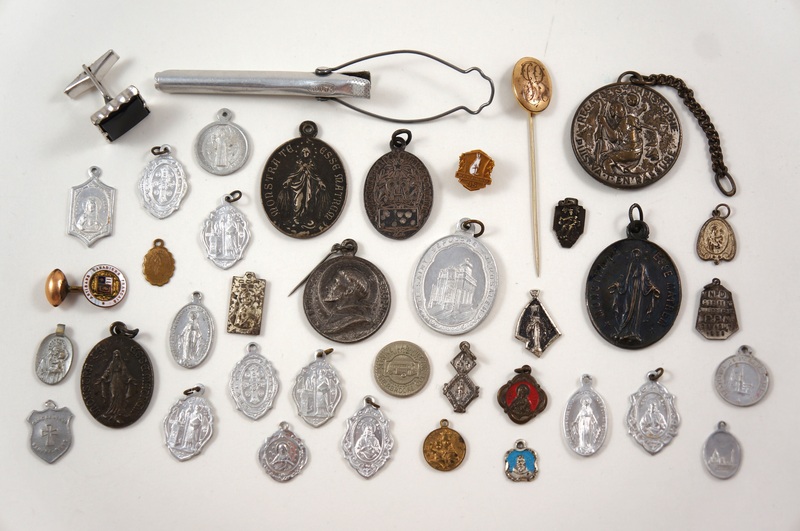 My favourite is the large Saint Christopher medallion (top right), but there’s also one commemorating the 700th anniversary of the death of St Francis of Assisi (which occurred in 1926), as well as several related to the Congregation des Enfants de Marie, which was some kind of Catholic association founded in France in 1838. 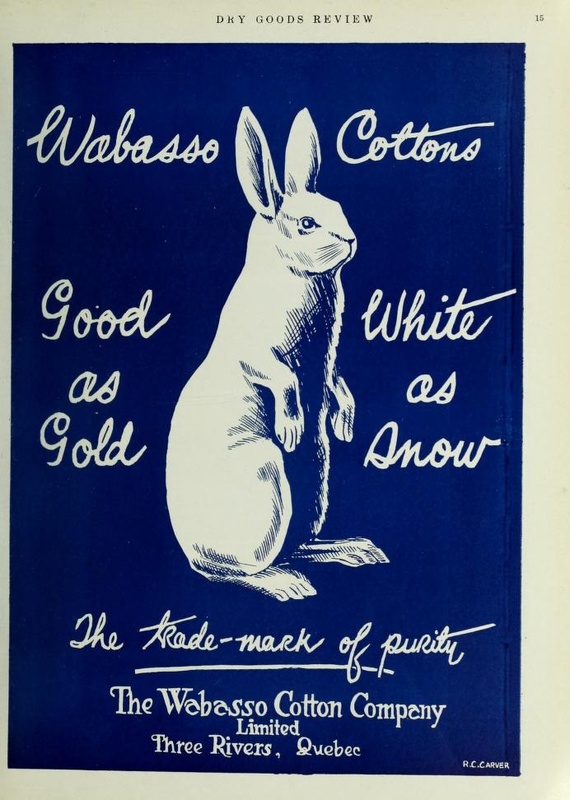 Otherwise, there’s a cool enameled Artisans Canadiens Francais cufflink (only one, unfortunately), an old Laramee transit token (from Sherbrooke Quebec, c.1952-1962), and a 10k gold pin that looks to have been given out for 35 years of service to Wabasso, an old textile company that used to have a factory in Trois-Rivieres. Finding gold is always nice, and I expect to get around 40$ for that pin. Here’s the reverse side of some of the more notable pieces. 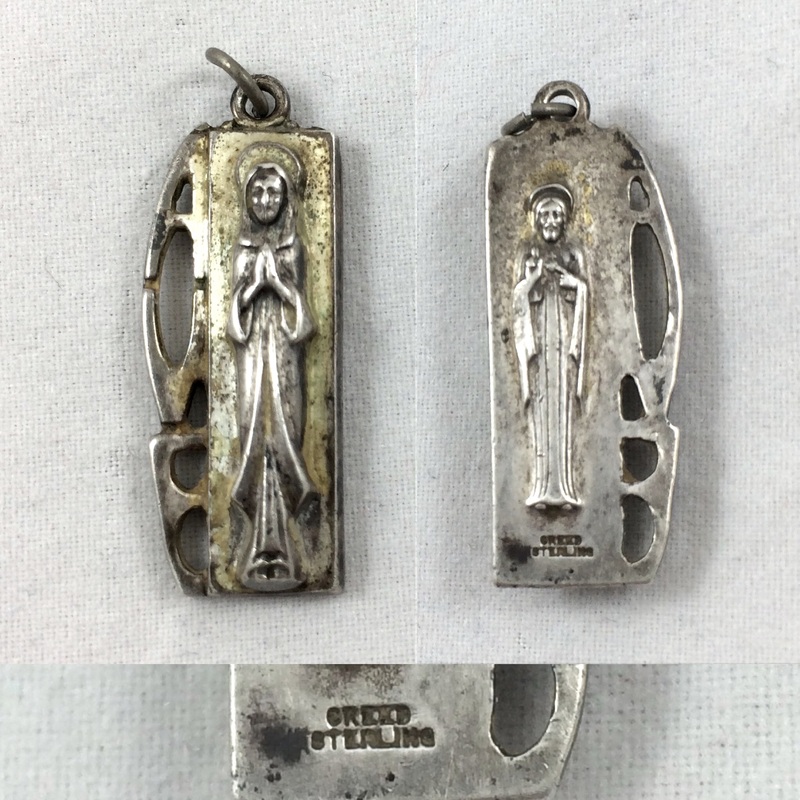 I expect the darkened ones are silver plated, there’s no hallmarks to indicate that they’re solid silver. I almost forgot to mention my only sterling silver find! It’s a pendant signed Creed Sterling, and should net me around 25-30$ once cleaned up. I had been planning on taking a break from that Tuesday evening route, but thanks to these finds I’ll head out there again next week. Hopefully I’ll find more tiny vintage treasures. 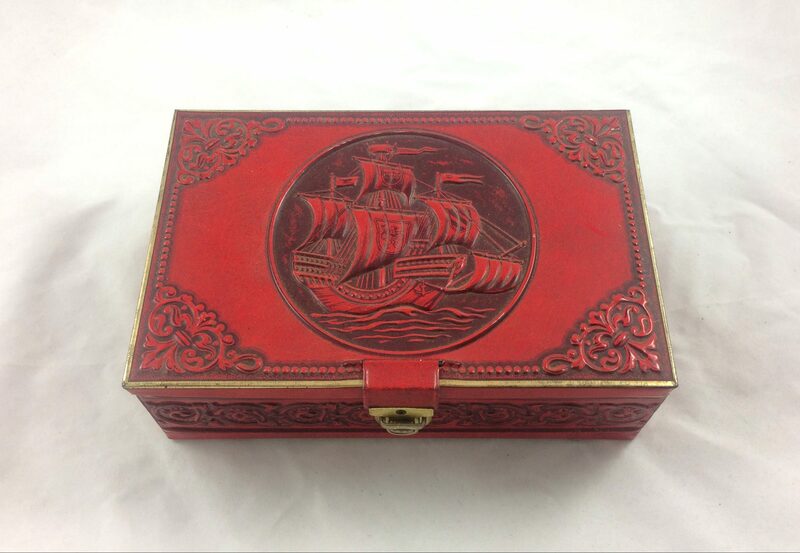 I love that vintage tin with the ship on the cover. What are its dimensions? I’d be interested in buying it. I’ve always been drawn to tall ships. I don’t have the dimensions off hand, but I’d say it’s around 7 x 5″. I can save it for you. Always fun reading your posts, hope these comments give you a hint of the enjoyment they bring. Especially love the way you arrange your finds for photos. Happy continuous hunting and stay safe out there. You have that sixth since for scavenging, great finds as always. In your collection of figurines, the bottom left figure looks like a Red Rose Tea ceramic figure. They have been including the figures in their boxes of tea since 1967. There hundreds of different ones, made by Wade of England. http://redrosetea.com/figurines has more information. Yup, I come across those Red Rose figurines semi-regularly. They’re good to sell when you have a collection of them. Love the shirt-button cards!. I think they could be adorable nicely framed and hung as art! I’m always so happy when you have a new post. I go back and look at it a couple of times as I usually miss some interesting finds. May you have many more!! 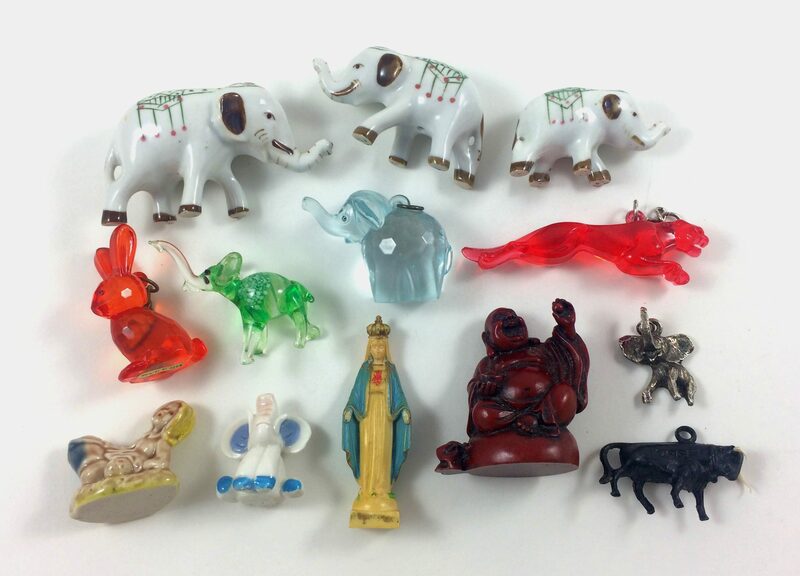 The fake crystal animals were gum ball machine or fair prizes in the early 70’s I believe. They used to come on a string. There were lots to collect. Cool, thanks for letting me know the history. I plan on keeping those myself, we have a little cabinet filled with miscellaneous figurines here that we use sometimes as board game pieces. Very interested in the tiny die ..both if you happen to find the other..will buy please contact. Maybe send me an email so I remember. I do think I have that other die somewhere in my personal collection, but where I can’t be sure. It’s a neat thing. Thank you for saving these treasures from the landfill so someone can enjoy them. I love reading your posts and seeing what you have found. Nice photos. You mentioned cleaning up the silver piece before taking it in. Do you polish your silver items before taking them in? I usually clean silver before putting it on Etsy or eBay, though if I like the tarnish (sometimes it looks quite nice) I’ll leave it on. 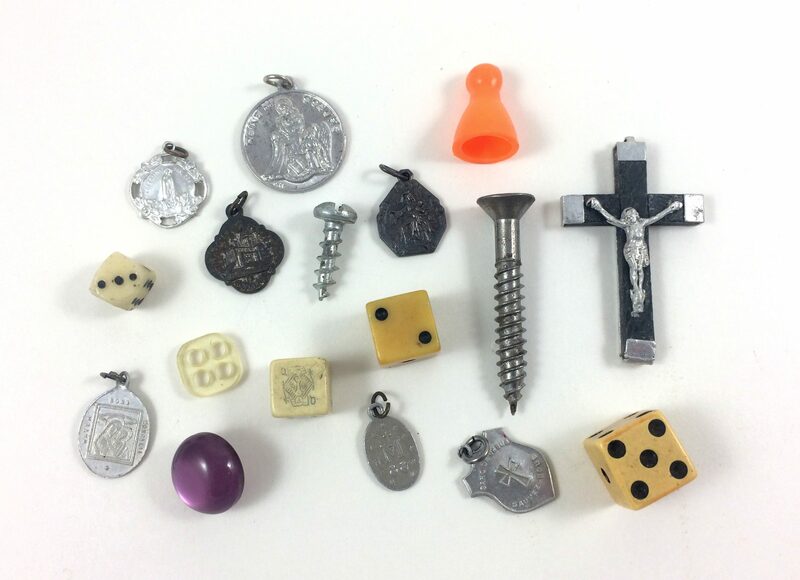 Also, some items like coins can lose value if cleaned. I don’t bother cleaning off the tarnish if I’m just planning on scrapping it. That makes sense, I have heard as well that elephants are popular with gamblers as a good luck charm. Not sure why exactly. Bravo.Hope you strike it rich this year,dear scavenger and environmentalist.Hope you will make $50,000 this year.There are four months left in 2017. Thanks, I hope so too lol. You never know.